Preface: Robert Pinsky was kind enough to let me in his class "The Occasions of Poetry" on Wednesday, January 10, 2007. I've not read much of his poems, except glancing through some of his translation of Dante's Inferno. So browsing through the Stanford stacks, I came across his book An Explanation of America (1979). What an interesting title! I've been trying to do this myself in my poem "Dove of Discovery". When I realized that Columba is the Latin word for dove, all sorts of images flooded my mind Noah, Christ, Jason and the Argonauts, discovery of America by Columbus, the District of Columbia with possibly Lady Columbia on top of the Capitol Building, Founding Fathers at Columbia University who were Freemasons, Emily Dickinson's "My brave Columba". I was curious to see whether Pinsky was aware of the dove symbol to America, and was disappointed in not finding any. 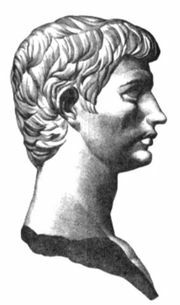 However I was profoundly disturbed to learn about two figures in Roman history Horace, the Roman poet whom I admire deeply, and Brutus, one of Julius Caesars assassins, whom I loathed as a traitor. This was especially true after seeing Joseph Mankiewicz's film Cleopatra last month at the Stanford Theatre, when Rex Harrison, playing Caesar was repeated stabbed by Brutus and others on the Ides of March 44 B.C. Brutus as portrayed in the film appeared a slimy character indeed. I wondered why Pinsky portrayed Brutus in a more favorable light. Is a poet's version more accurate than that of a film director? I want to expand my knowledge on the historical Brutus and Horace. Below is my 8-hour research for today in the Stanford stacks. And the Roman world was split by civil war. And served on the staff of the patriot-assassin. And business were lost, or confiscated. Usurping a power to which they had no right. To be received with honor by the mourners. In Rome itself, he spent his time, and wrote. Declared himself to be a happy man? For causes lost and glamourous and just. That soul up there who has to suffer most,"
his head inside, he jerks his legs without. see how he writhes and does not say a word! That other, who seems so robust, is Cassius. for us to leave; we have seen everything. Charles Singleton's commentary on Brutus in Hell is quite discerning. With this touch Dante has allowed the Roman Brutus a certain dignity. See the description of Jason as "that great one who comes there, and who does not seem to shed a tear for pain" in Inferno XVIII.83-84. 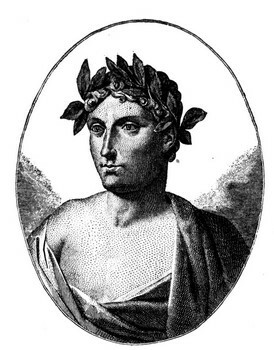 On the Ides of March in 44 BC, Julius Caesar was stabbed to death by a group of Roman nobles led by Marcus Brutus. The victim, Caesar, has an obvious appeal to posterity; he if anyone was a great man in the conventional sense. Yet Brutus, the 'noblest Roman of them all', the man of principle who killed his benefactor and whose action proved disastrous to himself and to Rome, is in some ways a more interesting character. Shakespeare at any rate thought so when he made him the dramatic hero of a play nominally about Julius Caesar. God wills us free, man wills us slaves. I will as God wills Gods will be done. I'm glad to have read Pinsky's An Explanation of America. which Plato calls the "Soul of the Universe" (Timaeus 35b).